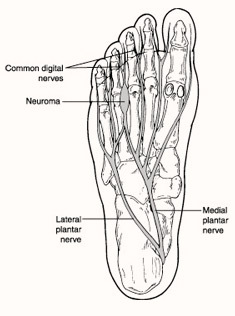 A neuroma is commonly described as a growth, or tumor, of a pinched nerve. In the feet, a Morton’s Neuroma is a swollen, inflamed nerve that causes thickening of the tissue around the nerve between the bases of the toes. It most commonly occurs along the bottom of the foot, between the bones of the smaller 3rd and 4th toes. The thickening of the tissue around the nerve is the cause of the compression and irritation of the nerve. This compression creates swelling of the nerve, eventually leading to permanent nerve damage. This is what makes Morton’s Neuroma an extremely painful condition which requires immediate podiatric attention. Anatomical abnormalities, such as a high-arched foot or a flat foot, can increase your likelihood of developing Morton’s Neuroma due to the instability around the toe joints. Injury or trauma to the area can cause damage to the nerve, resulting in inflammation or swelling of the nerve. Overly tight or poorly fitting footwear that causes the toes to be squeezed together can cause damage to the nerve, resulting in swelling and inflammation. The symptoms felt by patients who have Morton’s Neuroma are caused by the compression of the nerve between the ends of the metatarsal bones at the base of the toes. You may not actually see a bump, because this is not really a tumor. You may experience burning pain in the ball of the foot. You are likely to experience an increase in pain with activity or wearing tight shoes. You may experience foot pain that that radiates into the toes. You may experience tingling or numbness of your toes. Runners may feel pain as they place pressure around the area. High-heeled shoes can also aggravate the condition. Tight, narrow shoes also aggravate this condition by compressing the toe bones and pinching the nerve. The treatment of choice for Morton’s Neuroma varies depending on the severity. 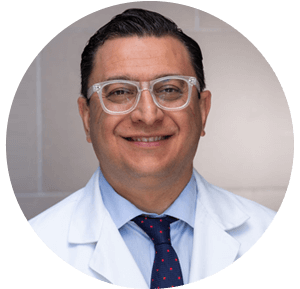 Identifying and diagnosing the neuroma early in its course often results in the best outcome as it can often avoid surgical treatment. If left untreated, neuromas progress and get worse. 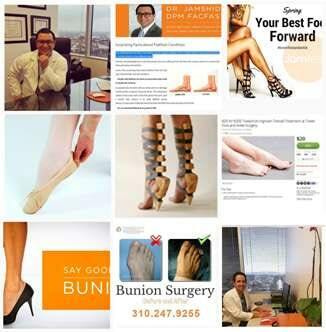 Early treatment focuses on relieving pressure on the area affected by the neuroma. Dr. Jamshidinia may use an X-ray to help determine the best approach to treatment. Different treatment options for Morton’s Neuroma include. Padding: Supporting the bottom of the foot with additional padding can correct the abnormal foot function and relieve the symptoms caused by the neuroma. Medication: Anti-inflammatory medications can be prescribed to relieve pain and reduce inflammation caused by the neuroma. Cortisone injections: steroid injections are commonly used to relieve pain and reduce inflammation associated with a neuroma. Custom Orthotic Devices: Dr. Jamshidinia can make you custom orthotics to help control foot function. Surgical Treatment: When all other treatment methods are unsuccessful, the neuroma will progress until surgical intervention is performed by a podiatrist. In surgery, Dr. Jamshidinia will remove the inflamed and enlarged nerve. Patients often take 1-2 weeks to recover from surgery.